Christiane Howey exhibited incredible dedication to our company and worked tirelessly to support conservation and researchers worldwide. 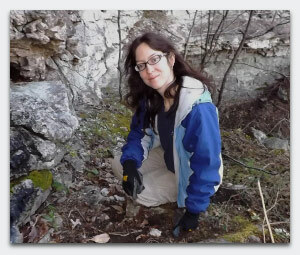 To honor her, we created the annual Christiane Howey Rising Scholar Award to aid early-career researchers through transmitter donations to their projects. Listed below are the previous recipients of this award. Alex Jahn, a postdoctoral researcher at the Smithsonian Conservation Biology Institute, Migratory Bird Center in Washington, D.C., received the award to study the migrations of critically endangered Hooded Grebes in Patagonia using Solar 9.5g PTTs. 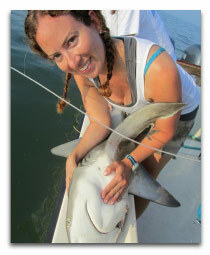 Jill Brooks, a PhD candidate at Carleton University in Ontario, Canada, received X-Tags to investigate the post-release survivorship of great hammerhead sharks in Florida’s recreational fisheries. Nishant Kumar, from the University of Oxford was awarded 25g GPS/GSM Transmitters to study black kites (Milvus migrans) in densely human-populated areas in India's capital city of Delhi and during their long-distance migrations. Katrina Phillips, from the University of Central Florida, USA used specialized Solar 9.5g PTTs to study juvenile loggerhead sea turtles (Caretta caretta) in the Gulf of Mexico. She examined ontogenetic shifts between coastal and oceanic phases. Read an update on her research of sea turtle dispersal in our Spring 2018 newsletter. 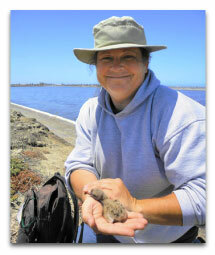 Heather Marshall, Postdoctoral Research Fellow at Mote Marine Laboratory, was awarded five X-Tags. She used blood physiology and tagging to study shark species in the Gulf of Mexico, as well as a potentially vulnerable population of salmon sharks in Alaska. The data gathered in this study allowed Heather and her team to examine effects of fishing-induced stress on salmon sharks. Heather is also a co-founder of The Gills Club, an international group that works to connect school-age girls with female scientists and empower them through scientific exploration. Before receipt of the Award, Marla had been working in conjunction for several years with local organizations to begin tracking Pallas's Fish Eagles with GSM technology. Since then, they have tagged eagles in Mongolia and India. 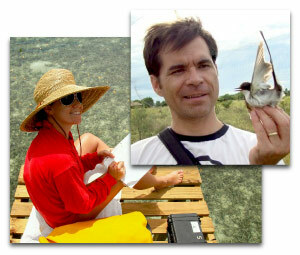 To read more about her work, check out her article "Where in the World Are Pallas's Fish Eagles?" in our Spring 2015 newsletter. 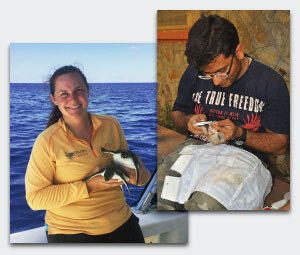 Katharine Goodenough, an ecologist with the San Diego Waterbird Research Group, received the Rising Scholar Award to study the migrations of Black Skimmers (Rhyncops niger) and Large-billed Terns (Phaetusa simplex) across the Amazonian Basin using Solar 5g PTTs. In 2014, Kate and her colleagues tagged seven Black Skimmers and ultimately documented migrations across the Andes Mountains as well as potential varying migration strategies. To read more about their findings, check out their article "Tracking Inter-tropical Migratory Movements of Waterbirds Breeding in the Peruvian Amazon" in our Spring 2015 newsletter.